Gaon Connection is an effort to give voice to rural India. Gaon Connection is India's biggest rural media platform, a two-way street that takes information to knowledge-starved rural communities and brings information about everything from problems to role models from media-dark areas to urban India. We create content customised for the rural citizens. Gaon Connection has several key verticals which includes digital, video content, print, audio content, India's biggest rural media survey team, and a massive ground presence of smartphone-armed cadres at the district, block and gram panchayat levels. Together, it is a combination unmatched in India's media landscape. The bedrock of Gaon Connection is it swiftly expanding cadre of digital-era community journalists who are part of its "Swayam Project". They are multiskilled, creating videos, audio content, community newspaper editions and carrying out ground activation across farflung geographies. They are part of a pyramid that has team leaders at the Block and District level, and in Lucknow where the Swayam Project editorial team rewrites, edits and packages the stories and publishes them. We are privileged to have won major journalism awards and earned acclaim for our work. 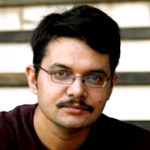 Founder Neelesh Misra and Associate Editor Manish Mishra have won India’s biggest journalism honour, the Ramnath Goenka Award for 2012 in the category “Uncovering Invisible India”. Editor-in-Chief Dr. S B Misra won the UNFPA-backed Laadli Award in “Best Editorial” category for North India. Roving Writer Anu Singh Choudhary won the Ramnath Goenka Award for her work in 2013 in the category of Sports Journalism. Britain’s Thomson Foundation selected Gaon Connection Principal Correspondent among 12 journalists from developing countries for high quality journalism. 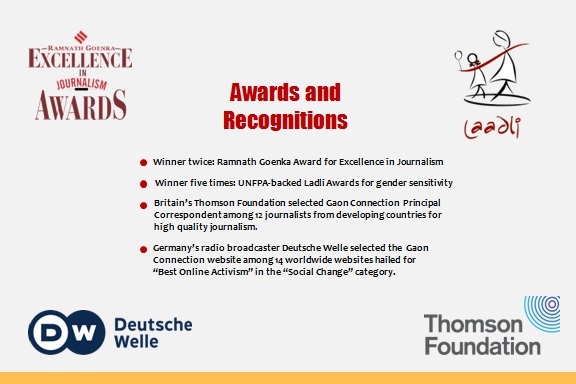 In April 2015, Germany’s radio broadcaster Deutsche Welle selected the Gaon Connection website among 14 worldwide websites hailed for “Best Online Activism” in the “Social Change” category. Laadli award for writing on gender (five times in all) won, apart from the editor in chief, by Anu Singh Choudhary, Shrinkhala Pandey and Devanshu Mani Tripathi. Doordarshan: With a primetime show on DD National called “Gaon Connection”. Quint: A unique show format that uncovers pivotal issuesthat were never talked about: The Neelesh Misra show .